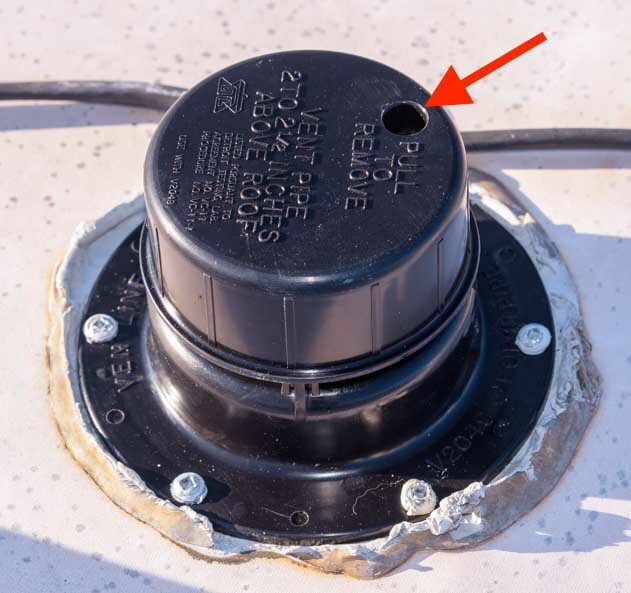 RV Roof Repair – Rubber Roof Patch + Holding Tank Vent Cap Replacement! 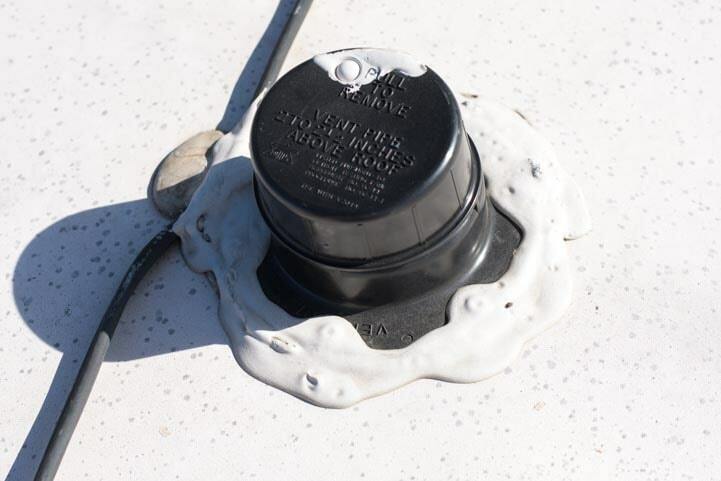 We recently repaired some rips and tears in our RV’s rubber roof, and we also replaced the roof vent cap for our trailer’s black wastewater holding tank. These are easy projects for anyone to do. This article shows the steps we followed to complete these repairs. We were in a hurry as we tackled these jobs because a days-long rain storm threatened to begin at any moment. 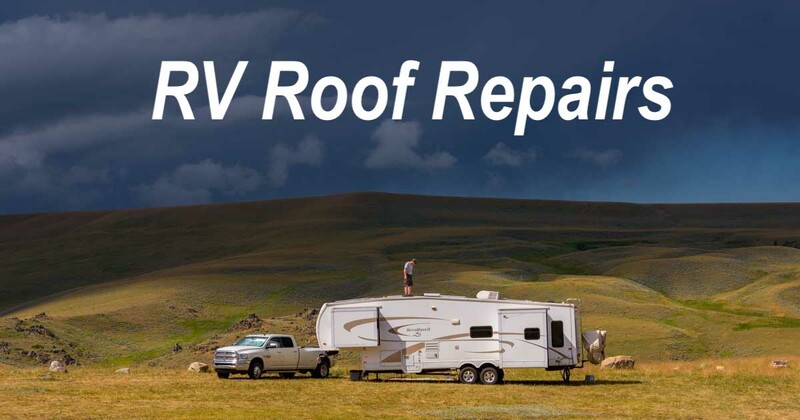 Also, our “ten year” RV rubber roof is now nearly twelve years old, so it is overdue for replacement. With these things in mind, our goals were speed of installation and watertightness that would hold for a few months. 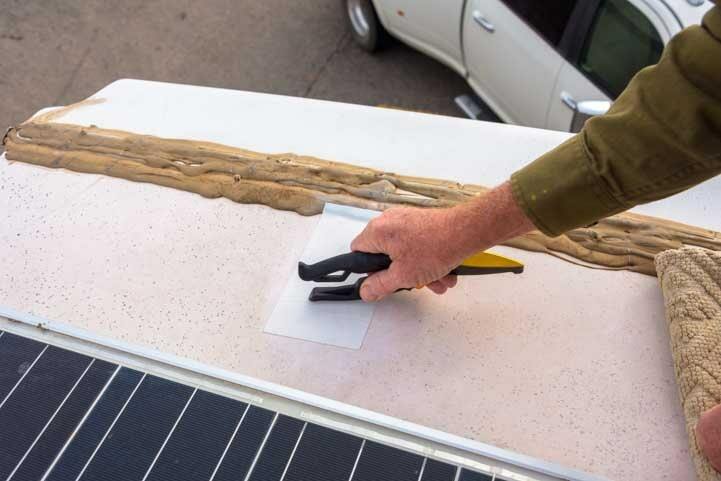 In this article we’ll point out the few shortcuts we took just in case you ripped your RV roof or knocked a holding tank vent cap off when your rig was years out from needing a new roof! We boondock all the time, and this kind of travel takes our trailer into some gnarly situations where it gets scraped by tree branches on the exterior walls and roof. 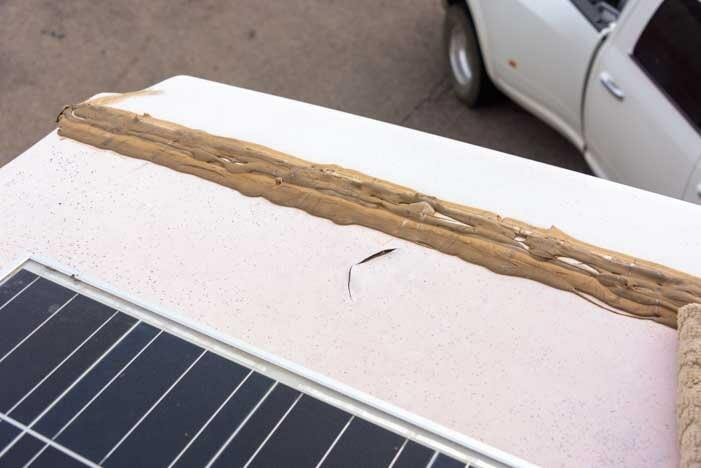 The sidewalls of our rig bear the tell-tale pin-stripe scars from tree branches, and our RV roof, well, the tallest items have taken the brunt of the damage. The black wastewater holding tank vent pipe has a cap on it to keep rain and creatures out, but ours got sheared right off when we accidentally dragged on an unforgiving tree branch. The first task in the repair was to remove the screws holding the cap onto the roof. These were easy to locate because there was a dollop of Dicor Lap Sealant covering each one. The black tank vent cap was knocked off by low hanging tree branches. In this photo Mark has already removed a few screws that attach the cap flange to the roof. The next task was to lift the entire vent cap flange off of the black tank vent pipe. This revealed the black tank vent pipe. 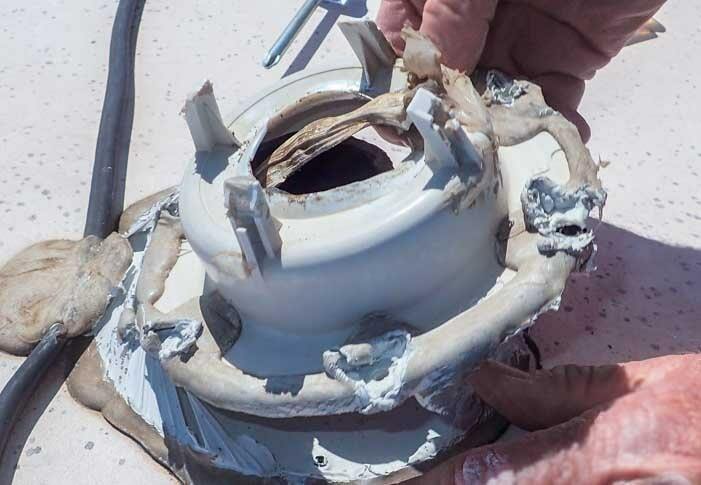 A small piece of the top of the black tank vent pipe had broken off, but the damage was merely cosmetic. The new black tank vent cap would cover it. 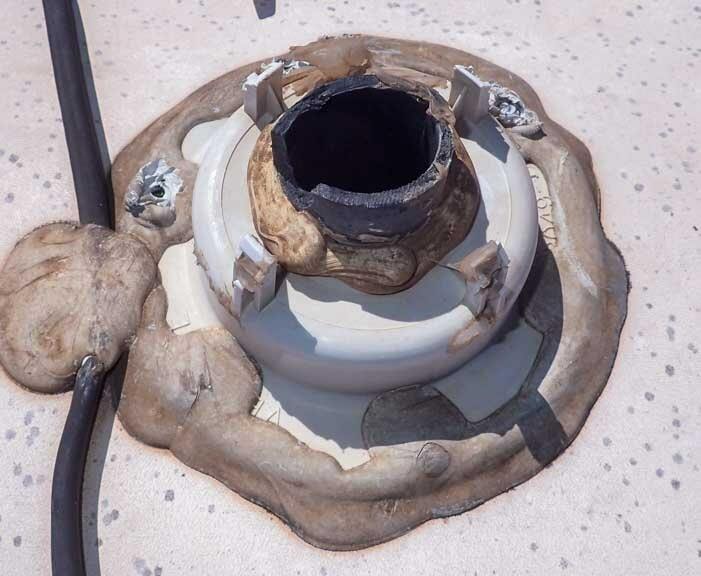 The next step was to clear away the old Dicor Lap Sealant that formed a ring around the old black tank vent cap so the roof was smooth instead of having a crusty ring of old sealant. 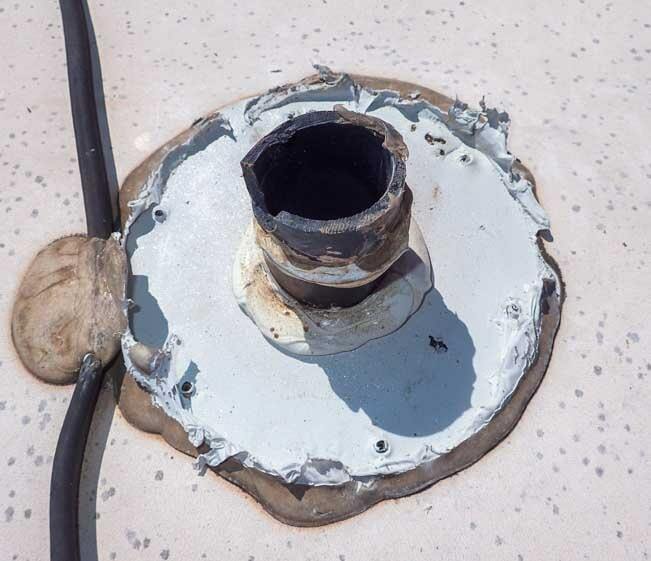 The key to this RV roof repair is making sure the new black tank vent cap has a watertight seal with the roof so there won’t be any leaks. A generous spread of Dicor Lap Sealant does the trick. 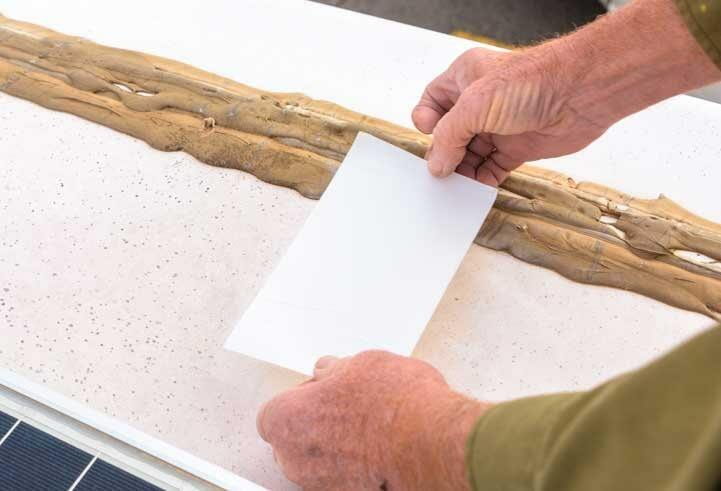 It comes in a tube and is applied with a caulk gun. 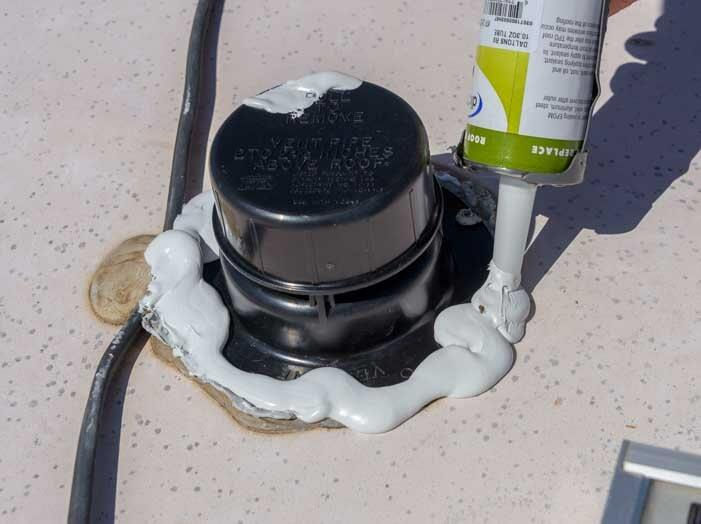 Before placing it in the caulk gun, Mark clipped off the tip so the Lap Sealant could flow out. 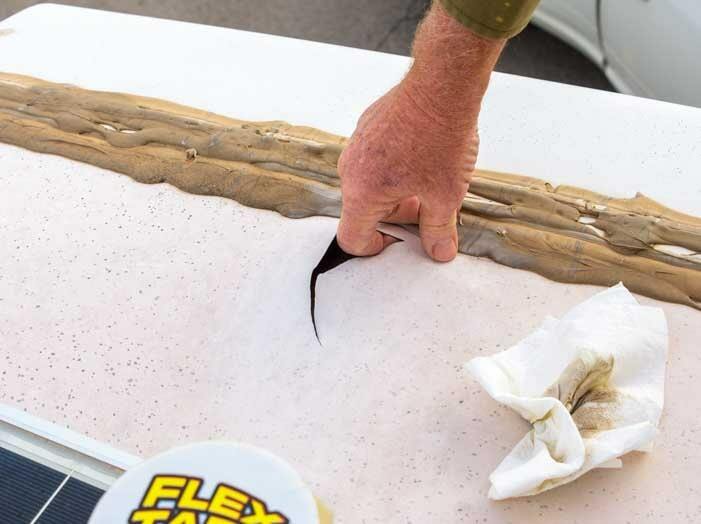 Prepare new tube of Dicor Lap Sealant and then lay a thick layer around the vent pipe. Then he spread a thick bead of Dicor Lap Sealant around the vent where the screws would attach the cap, and then screwed in the screws. Screw the new vent cap onto the roof. A final screw went into the top of the cap. The old black tank vent cap may not have had this screw right from the factory, and that may be why it was knocked off so easily. We don’t know because we never looked at the old cap that closely! Be sure to screw the cap itself onto the base. 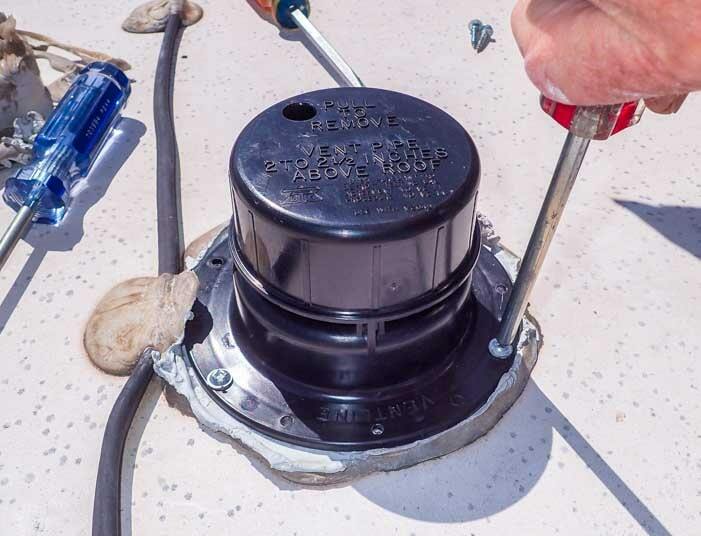 Then Mark spread generous bead of Dicor Lap Sealant around the outside of the vent cap, leaving a nice dollop on each screw head, including the one on the top of the cap. 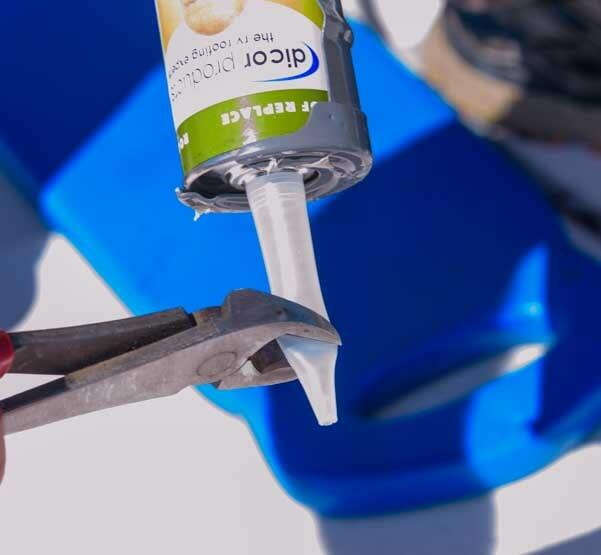 Put a thick layer of Dicor Lap Sealant around the base with a dollop on each screw head. Here’s how it looked a few months after the job was completed. If you’ve been wondering about the wire next to the vent, it is the cable that connects our four solar panels together in series on our roof. 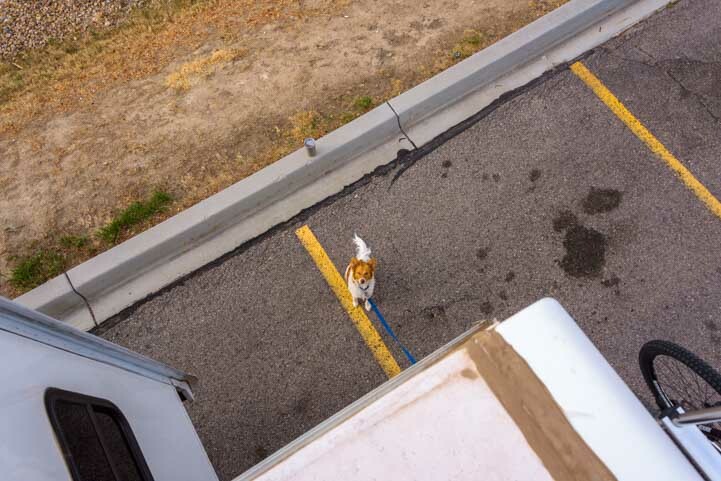 Down on the ground far below us, our little project supervisor wondered how it was all going. The project supervisor asks how the vent cap replacement is going. 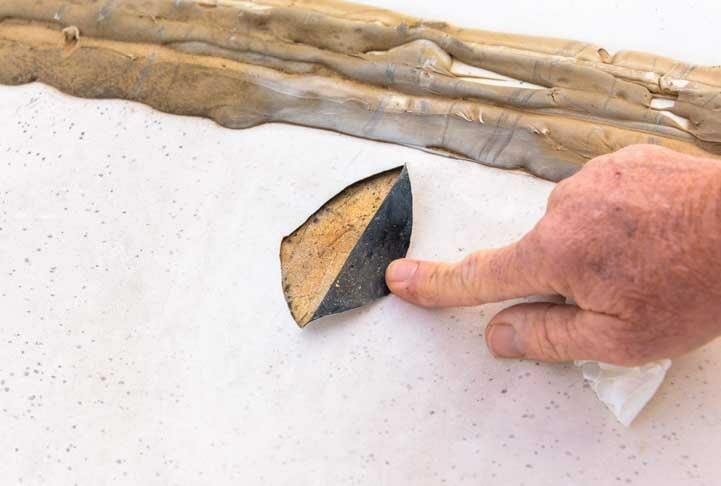 Our other RV roof repair was to fix a tear in the thin rubber sheet that covers our RV’s roof. This job is so quick to do that the first time Mark did it in a location on the roof of one of our slide-outs, I didn’t even know he had started the job when he bounded in the door announcing he had just finished it. “But I wanted to take pics!” I said. “Ya gotta be faster next time!” He joked. So, this time around, when I heard him mumble something about fixing a tear in the roof, I jumped up and ran for my camera and made sure I followed him up the ladder right away so I wouldn’t miss anything. 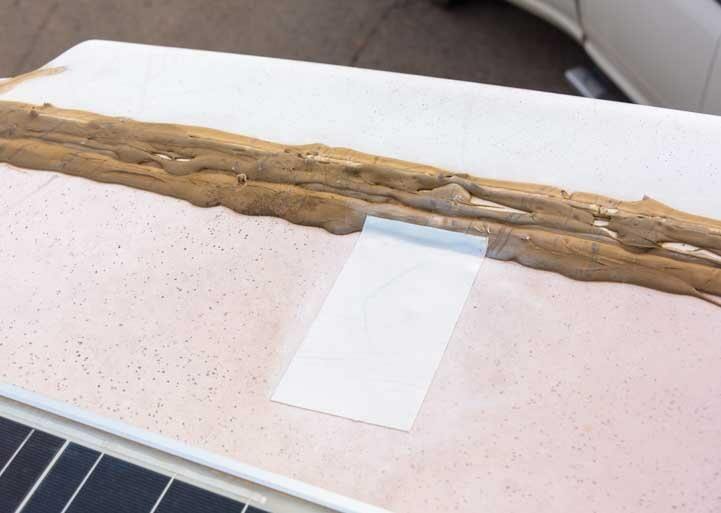 As rubber roofs age, they become more and more susceptible to rips and tears from low lying branches and other obstacles dragging as you drive underneath. 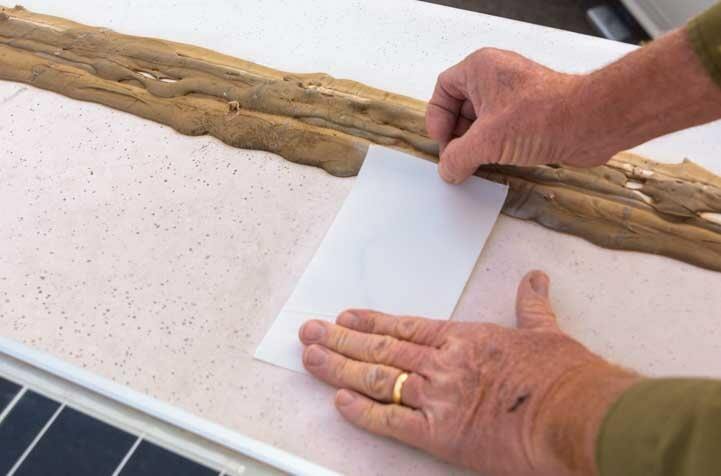 All that is needed to patch an RV rubber roof is a cleanser that can clean the crud off the roof around the tear, some scissors and some repair tape. The preferred repair tape is EternaBond Tape. Unfortunately, we didn’t have a roll with us and there were no RV supply stores within 100 miles or so. 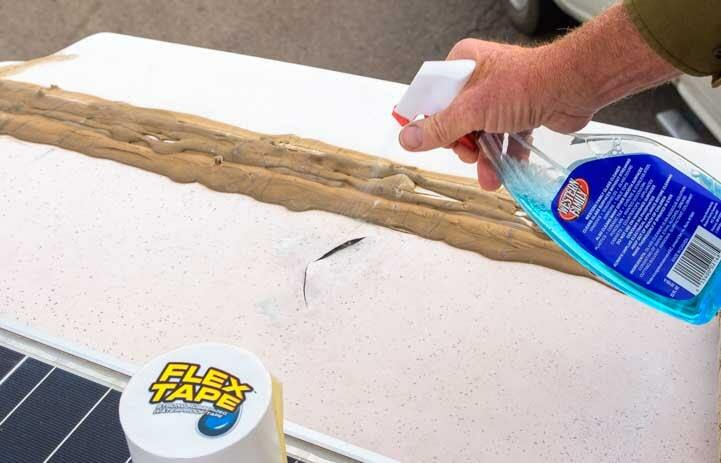 But the local hardware store carried Flex Tape, and that worked just fine. 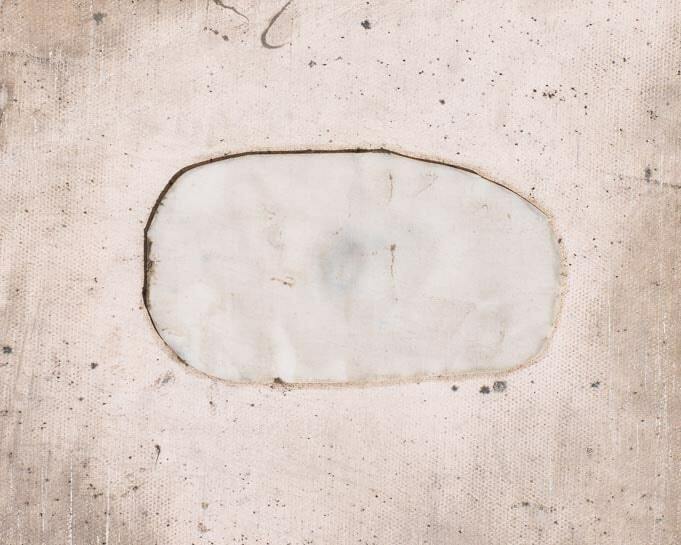 Applying a patch requires just a cleanser, some patch tape and scissors. Mark cleaned the area throughly so the tape would stick well. He used a glass cleaner to cut any grease. Clean the area thoroughly so the new patch tape will adhere well. Then he felt under the torn area to see if there was any lumpy debris in there. Sure enough, he pulled out a twig! Check to be sure nothing is lodged under the rubber roofing material. A twig was hiding under there! This was a serious tear, but once he got the wound cleaned up it was ready to for a field dressing. 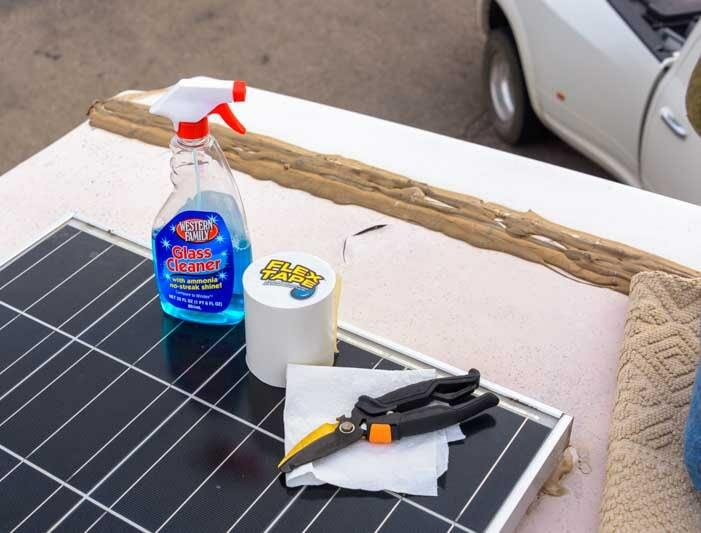 The thin rubber roofing sheet is all that protects the underlying plywood from the elements. All cleaned up and ready for the patch. 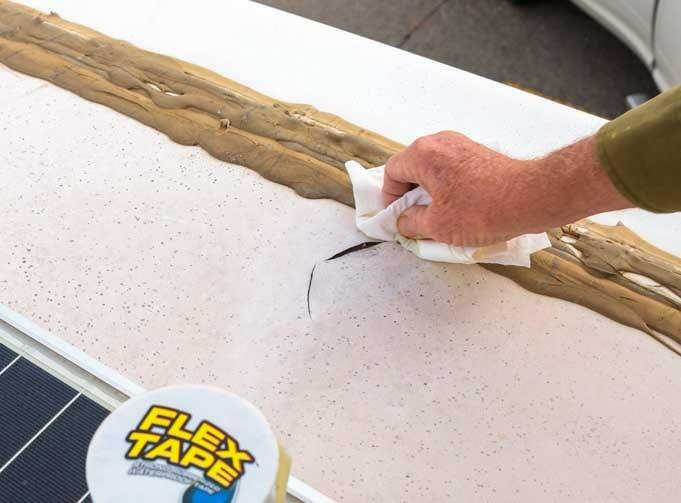 He cut a piece of Flex Tape big enough to cover the tear. Then he pressed it in place, first with his hands and then with the back of his scissors. Cut a piece of tape that is generously wider than the tear. Press the patch into place. 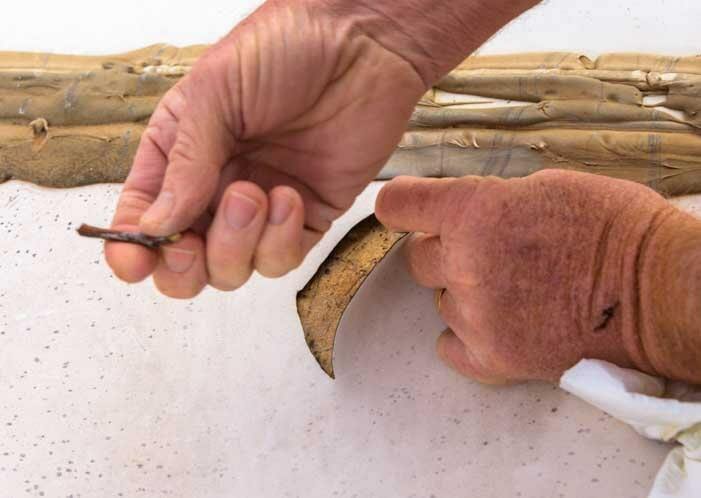 Seal it and make sure there are no air bubbles by pressing something flat on it. As an aside, Mark really likes these heavy duty Fiskar shears. They have a wire cutting notch on the back and they come with a sheath and a clip for hanging them from a belt loop. Done! If we weren’t hurrying, the corners would be rounded and the tape wouldn’t rest on the old Dicor. So, the job was done in just a few minutes. 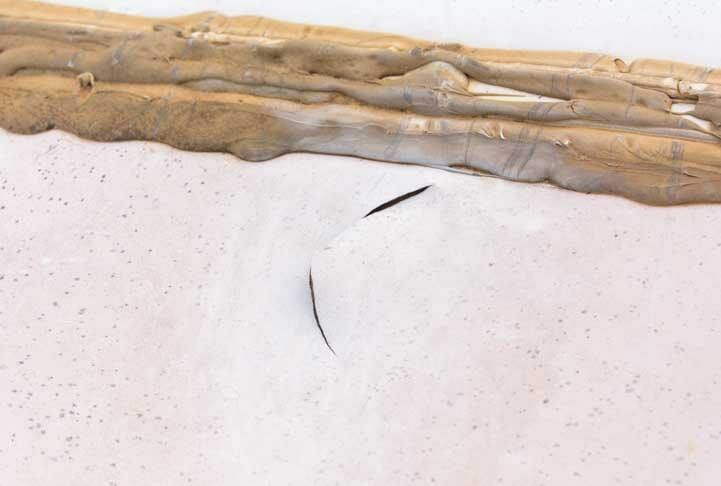 A better way to cut the patch is to round the corners so they aren’t inclined to peel up. Also, sizing the patch so it is attached only to the rubber roofing material and not the lap sealant on the front cap would have been a better technique. But, as I said, rain was on its way in a few moments and a new roof was on its way in a few months. Here is a pic from the other roof patch he did on the roof of one of the slide-outs several months ago. Another patch about 6 months after completion on the roof of one of our slide-outs. Not long afterwards, the wild rain storm rolled in. Fortunately, the RV roof repairs were good and we were snug and dry in our trailer. The project supervisor was satisfied with the work, and we were warm and dry when the rains came. This entry was posted in RV & Boat Projects & Upgrades and tagged Full-time RV Lifestyle, New, Non-Travel by Roads Less Traveled. Bookmark the permalink. Nice Job 12 yrs old….still looking good….interesting amount of Dicor on the front cap…..lol…. Thanks, Mike. Well, the joint between the front cap and the roof has needed an extra dollop now and then! That’s what I say, Bob. 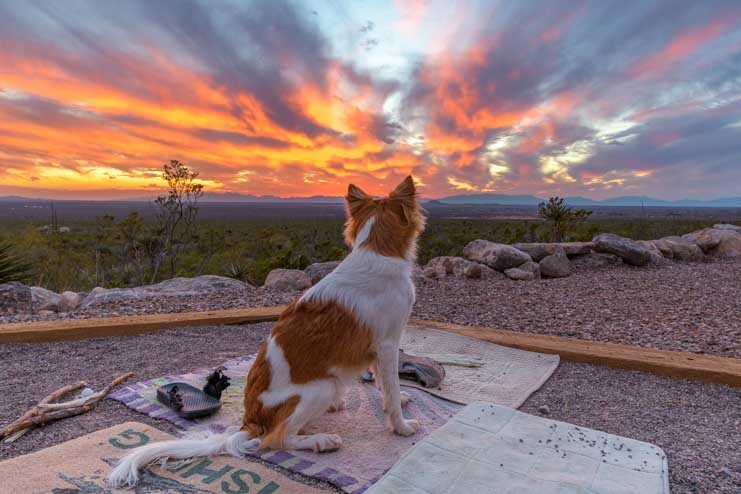 Puppy Chow is an important part of everything we do, from hiking to tooling around in the truck to RV repairs!! How wonderful to know we inspired you to become full-timers, Rich & Lee!! I’m so happy we could lend an inspiring hand. We have not installed a new roof yet, but it’s good to know you life your RV Armor roof. We’ve been looking for a new rig for five years now and still haven’t come across the right one. Most of the best fifth wheel builders went out of business in the aftermath of the recession, and the choices that remain haven’t given us enough warm and fuzzies to take the plunge and buy a new one. So, we keep repairing this one! Enjoy your travels and your new Vanleigh if you get one!! Yes, indeed…Project Supervisor on patrol !! !